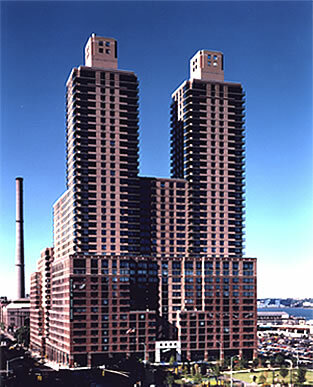 This expansive urban development (located on the 4-acre former site of a New York Times printing plant) involved the developer and architect, numerous city agencies and the community planning board in a complex planning and rezoning process. With over 1,000,000 sq. ft., the project has 1,000 rental apartments, 38,000 sq. ft. of neighborhood retail stores, 8,000 sq. ft. of space for community organizations, a 12,500 sq. ft. health club and parking for 350 cars. Two hundred apartments provided for low- to moderate-income tenants make for a model of economic integration. A new 45,000 sq. ft. public park was built by the developer, and three new street extensions established a grid of traditional city blocks.